A handsome pyramidal tree that is excellent to provide good vertical accent in landscape projects. 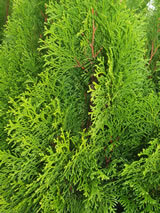 It has rich green foliage with fresh green tips, in fan-shaped clusters. Excellent as a specimen or hedge. Very hardy and reliable. Great for formal gardens, and shelter. Grows in sun or semi-shade / Tolerates coastal sites / Tolerates exposed sites. / Will tolerate very hard frosts.